At our home in Wyoming we burn all standing dead lodgepole pine, either beetle killed or wildfire victims. 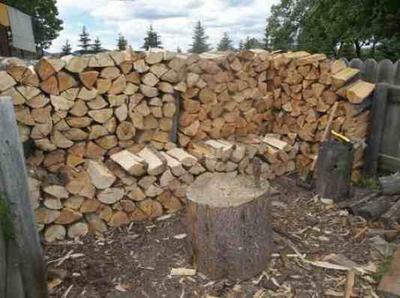 It has a good straight grain for splitting, it creates a quick hot fire and leaves very little ash. It's about all we have available and we can get firewood permits from the Forest Service to cut on the Big Horn National Forest. We call ourselves the Beaver Creek Mule Co. We used to sell a few mule colts but anymore it's just my wife and I and our saddle/pack mules (2), a pasture pet burro and our three dogs. I just brought a truck load of lodgepole chunks off the mountain yesterday. I have a Ford Ranger and when the box is full that's enough for the morning's effort. I probably have enough firewood cut and split to last the winter but I like cutting and it gives me an excuse to head back up on the mountain with at least one of the dogs for company. I like to burn Juniper and/or cedar firewood. It burns quick, it's easy to light and fast to cure. Arizona has a super arid environment during the summer which allows the wood to cure pretty fast. Also, Juniper grows everywhere heading towards New Mexico. One downside is that you go through chains faster then you want, plus certain types have furry bark so sand blown by the wind gets in the bark.